The Black Horse Troop originated as the 1st Illinois Cavalry that was converted into the 2nd and then 122nd Field Artillery to serve in the First World War. As the artillerymen were also horsemen, the 1925 addition to the Chicago Avenue Armory provided an arena and horse stables. The 122nd Field Artillery regiment was the first to play polo in the new armory. In 1921, the 1st Illinois Cavalry was reconstituted as the 106th Cavalry with regiments throughout Illinois. In January 1929, in addition to their National Guard duties, the 106th Headquarters Troop and its mounted band became the regiment's ceremonial unit. Known as the Chicago Black Horse Troop and Mounted Band, the unit escorted visiting dignitaries and led ceremonial parades. "The Chicago Black Horse Troop Association" was formed to raise funds for uniforms and other expenses that went well beyond the Illinois National Guard's allotment. The 1937 addition to the Chicago Avenue Armory, familiarly known as the Black Horse Troop Armory, added space to the original building and provided an expanded arena which became a popular indoor polo venue, and served as a way of raising funds for the Troop. This section of Shifting Grounds would not be complete without talking about Paul Butler. An early member of the Black Horse Troop, Butler helped established the game of polo in Chicago and in the Midwest with his Oak Brook polo fields, which still exist today in that western suburb of Chicago. Butler's granddaughter, Reute Butler, generously allowed me access to the family's collection of photographs and scrapbooks. 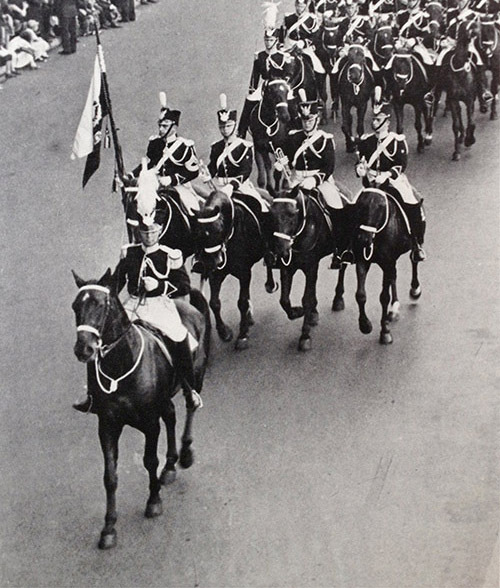 In the 1933 photograph at the right, Commander Paul Butler, leads the Black Horse Troop at the front of the parade that opened the Chicago World's Fair, A Century of Progress.